This oblong fish has small eyes over a pointed snout, and a continuous dorsal fin to a square caudal fin. Their colors vary by age and gender, but they range from gray to light brown with darker blotches or squiggles, giving it a faint marble pattern, or darker to a camouflage pattern. 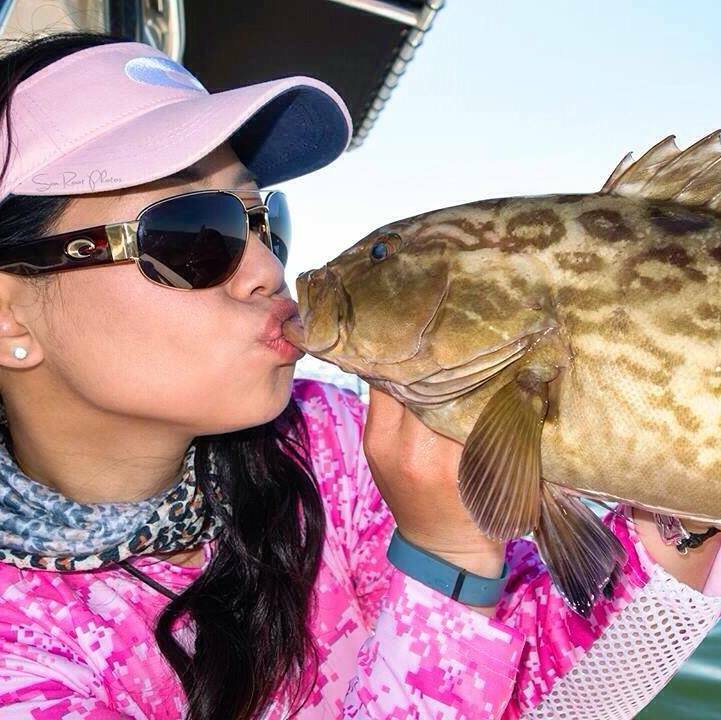 Like many groupers, they start out as females, and then change into males at a certain age or size after a few spawning seasons. They prefer rocky or grassy bottoms of coastal waters in the Western Atlantic, where they can hunt crustaceans and smaller fish, and grow to well over 4 feet long. English language common names include gag grouper, charcoal belly, gag, gag-velvet rockfish and velvet rockfish. Other common names are abadejo (Spanish), aguají (Spanish), badèche baillou (French), badejo (Portuguese), badejo brando (Portuguese), badejo-bicudo (Portuguese), badejo-branco (Portuguese), badejo-da-areia (Portuguese), badejo-saltão (Portuguese), badejo-sapateiro (Portuguese), cuna (Spanish), Cuna aguají (Spanish), fløjlsbars (Danish), garoupa (Portuguese), and serigado-badejo (Portuguese). 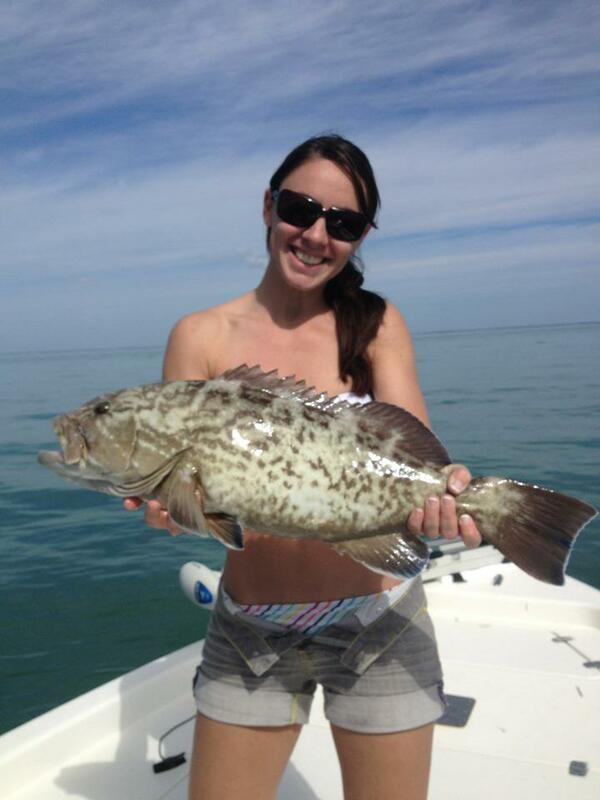 The gag grouper provides important recreational and commercial fisheries. It is caught with hook and line and the flesh is marketed fresh. There have been reported cases of ciguatera from human consumption of gag grouper. Ciguatera poisoning is caused by dinoflagellates (microalgae) found on dead corals or macroalgae. By feeding on these corals and macroalgae, herbivorous fishes accumulate a toxin generated by these dinoflagellates. Largely a phenomenon of tropical marine environments, ciguatoxin accumulates still further in snappers and other large predatory reef species that feed on these herbivorous fishes. If accumulated levels of the toxin are great enough they can cause poisoning in humans whom consume the flesh of these fishes. Poisoned people report having gastrointestinal problems for up to several days, and a general weakness in their arms and legs. It is very rare to be afflicted with ciguatera poisoning. The gag grouper is found in the western Atlantic Ocean from North Carolina (US) south to the Yucatan Peninsula (Mexico). It is scarce in waters surrounding Bermuda. Juveniles have been recorded as far north as Massachusetts. There have also been records of gag grouper occurring off the coasts of Bermuda, Cuba, and eastern Brazil. Residing in brackish to marine waters, the gag grouper is found offshore on rocky bottom as well as inshore on rocky or grassy bottoms to depths of 500 feet (152 m). It is common on rocky ledges along the eastern Gulf of Mexico. No, but I've had the sandwich. Linked at Pirate's Cove in the weekly "Sorta Blogless Sunday Pinup" and links. Wombat-socho has "Rule 5 Sunday: Tuesday Weld" ready for business.